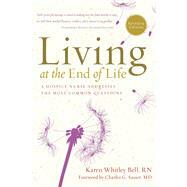 An updated edition of the most respected book on hospice care—for both patients and caregivers. This warm and informative resource on hospice and other end-of-life care options now gets an update. It receives a new preface and revised guidance on elders who need more long-term care and support, recommendations on pain medications, and advice for those living extended lives with treatable, but not curable, diseases. Written by a hospice nurse, Living at the End of Life reassures us that this difficult time also offers an opportunity to explore and rediscover a richer meaning in life. Drawing on her years of experience, Bell has created a comprehensive, insightful guide to every aspect of hospice care and the final stages of life. For people in hospice, as well as their friends and families, this is an indispensable and trustworthy source of comfort and spiritual healing. Karen Whitley Bell, RN, CHPN, is a hospice nurse with over two decades of experience. She lives in Seattle, where she advocates for the rights of the dying and the advancement of hospice care.